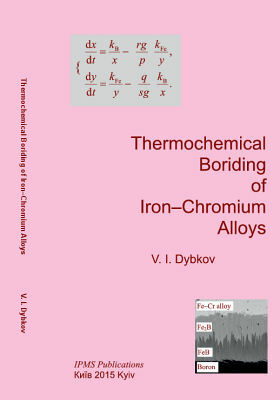 *Mechanism and kinetics of interfacial formation of boride layers in the course of thermochemical boriding of Fe–Cr alloys and chromium steels are considered. Experimental data on their microstructure, growth kinetics, phase identity, chemical composition, microhardness and abrasive wear resistance are presented. *Addressed to researchers, engineers, post-graduates and students of chemical, physical, metallurgical and related specialties. *Print version: ISBN 978-966-02-7668-0, IPMS Publications, Kyiv, 2015. Softcover, 145x210 mm, 124 pages, 70 figures, 32 tables, 83 references. Available on request. Price: USD 35.00 / EUR 32.00. For more detail, please do not hesitate to contact vdybkov@ukr.net. *Online version: ISBN 978-966-02-7669-7, IPMS Publications, Kyiv, 2015.